An 86-year-old man with a history of hypertension, hyperlipidemia, coronary artery bypass surgery in 1999, and mitral valve replacement with a 33-mm Hancock II valve (Medtronic) in 2002 presents to the clinic reporting exertional dyspnea and edema of 6-month duration. He is found to be in New York Heart Association class III. The patient’s medical history is additionally pertinent for ventricular tachycardia after cardioverter-defibrillator implantation, abdominal aortic aneurysm repair in 2010, chronic atrial fibrillation (on warfarin), embolic stroke in 2002, and chronic obstructive pulmonary disease. Transthoracic echocardiography demonstrates mild mitral stenosis and severe mitral regurgitation (Video 1). Transesophageal echocardiography (TEE) demonstrates severe mitral regurgitation secondary to flail leaflet of the bioprosthetic mitral valve (Video 2). Left and right heart catheterizations demonstrated a patent saphenous vein graft to the left anterior descending and diagonal arteries. Right heart catheterization revealed that the right atrial pressure was 16 mm Hg and his pulmonary arterial pressure was 72/29 mm Hg, with a wedge pressure of 36 mm Hg. The patient was seen and evaluated by cardiac surgery and was believed to be at elevated risk for a third reoperation, with a Society of Thoracic Surgeons calculated score for isolated mitral valve replacement mortality of 8.4% and morbidity and mortality estimated to be 36.8%. Figure 1. CT sizing of the mitral bioprosthesis. A multiplanar, retrospectively gated contrast CT of the chest was performed for procedural planning. 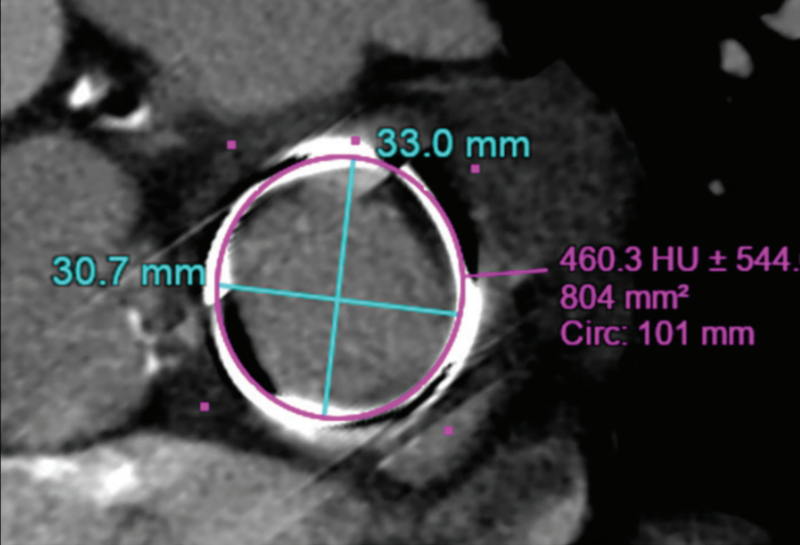 CT sizing of the bioprosthetic mitral valve demonstrated the maximal and minimal internal frame diameters to be 30.7 X 33 mm, with an area of 804 mm2 (Figure 1). How do you size a bioprosthetic mitral valve for a potential valve-in-valve procedure (balloon size, TEE, CT)? With an area of 804 mm2, would you attempt to do a transseptal transcatheter mitral valve-in-valve replacement (TMVR)? Dr. Barbanti: In my practice, in cases of valve sizing for treating degenerated bioprostheses (either aortic or mitral), I mostly rely on the dimension of the internal diameter provided by each valve’s manufacturer. I follow the recommendation reported in the app developed by Bapat and colleagues (Aortic ViV and Mitral ViV). I think CT carries some limitations for sizing purposes, and it is helpful to assess the left ventricle geometry and to screen for potential left ventricular outflow tract (LVOT) obstruction. In such cases of degenerated mitral bioprostheses, the transseptal route (using the balloon-expandable Sapien 3 device [Edwards Lifesciences]) has now become my preferred approach. The area of 804 mm2 is likely overestimated and, in my opinion, reflects the limitations of CT sizing in these settings. An overfilled indeflator (just for backup in case of the absence of transcatheter valve waist after nominal inflation) may be an alternative in borderline cases like this one. Dr. Guerrero: I like to use CT scanning when possible. Although it may be very challenging, particularly in nonradiopaque prostheses, I find it useful to corroborate the expected measurements based on the manufacturer’s information, and most importantly, it helps evaluate the risk of LVOT obstruction. In some cases, CT has identified that the suspected size of the bioprosthesis is incorrect. When a major discrepancy in size is identified by CT, this allows team members to make additional efforts to verify the size, including checking the manufacturer’s patient database if not already done. A multicenter study evaluating different CT methods for sizing is currently underway. We expect to know soon if this study finds that measurements are reproducible and if the interobserver variability is acceptable. This is not well understood at this time. Therefore, it is recommended that heart teams use a multimodality approach for correct sizing, which includes information from the operative report, implant card, manufacturer’s database with data of the patient evaluated, and TEE and CT if, available. Figure 2. Computer-aided design for virtual implantation of a 29-mm Sapien 3 valve into the degenerative mitral bioprosthesis. Regarding the annular size of 804 mm2, I suspect the measurement may be too generous. This is an example of the limitations of CT methods at this time. Provided that we have the correct implant data, if we trust the inner diameter listed by the manufacturer, we should expect an inner diameter of 28 mm. Therefore, I would treat with a 29-mm Sapien 3 valve. I would prepare the valve with at least 4 mL of additional contrast and would probably use the entire amount during deployment to allow flaring of the transcatheter heart valve (THV) in the left ventricle, which improves anchoring and decreases the risk of embolization. 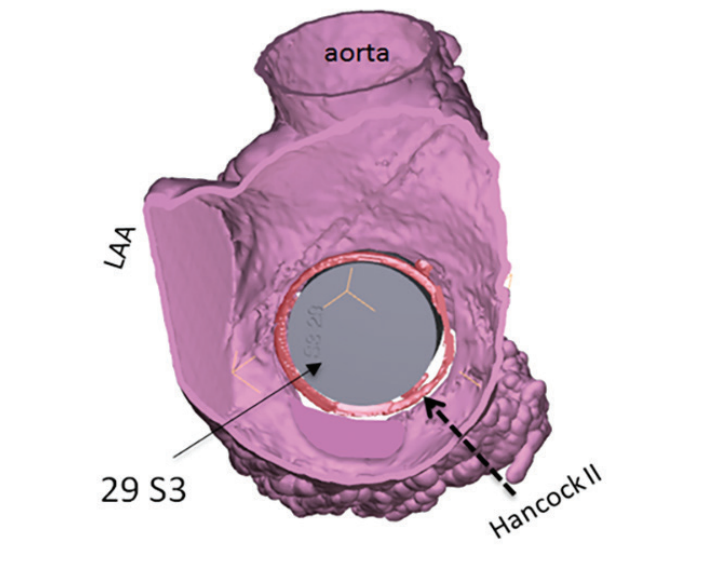 Additional computer-aided design modeling is performed of the patient’s mitral anatomy, with simulation of a 29-mm Sapien 3 valve in the Hancock II degenerative mitral bioprosthesis. The 29-mm Sapien 3 valve is noted to fit the inner waist of the Hancock II bioprosthesis without risk of embolization (Figure 2). Neo-LVOT prediction modeling is performed with the 29-mm Sapien 3 valve modeled with the most ventricular portion of the bioprosthetic valve frame and is found to be 511.2 mm2 in size (Figure 3). Figure 3. Neo-LVOT prediction modeling by CT-generated three-dimensional computer-aided design planning. Would this person be a candidate for TMVR? Are there any additional valve deployment questions you would want investigated prior to proceeding to the TMVR procedure? Dr. Guerrero: I think this patient is a very good candidate for TMVR with a 29-mm Sapien 3 valve prepared with 4 mL of additional contrast. The risk of LVOT obstruction is very low. Dr. Barbanti: This is a reasonable candidate for TMVR using a 29-mm Sapien 3 valve through the transseptal route. I do not see any adverse anatomic features that would contraindicate the procedure. CT fluoroscopic fusion overlay of the C-arm angles are generated of the bioprosthetic valve (Figure 4). On the CT-generated fluoroscopic images, it is noted that the bioprosthetic surgical valve is not completely radiopaque. Only the sewing ring of the surgical mitral bioprosthesis and the distal strut markers of the bioprosthesis are visualized. Figure 4. CT-generated fluoroscopic TMVR C-arm projection. Please elaborate how you would use this CT plan to align your 29-mm Sapien 3 valve delivery. Dr. Guerrero: The height of a 33-mm Hancock II is 23 mm. The height of a fully expanded 29-mm Sapien 3 valve is 22 mm. We can anticipate some degree of underexpansion in mitral valve-in-valve procedures because the surgical prosthesis being treated is usually smaller. Considering that the Hancock II valve has a rigid sewing ring that does not expand nor can it be fractured, I anticipate a slightly underexpanded THV that may have a final height between 22 and 23 mm, if not higher. We should ensure that the final position of the THV covers the location at which anchoring best occurs, which is the sewing ring. Therefore, I would like to see 1 to 2 mm of THV stent on the atrial side of the sewing ring. One more feature to consider is that the Hancock II has porcine leaflets that are short and end at the atrial side of the ventricular radiopaque markers. Therefore, placing a THV in a more ventricular position than the markers may not provide additional benefit. When the height of the bioprosthesis treated is shorter than the height of the THV, I prefer to place the ventricular edge of the THV in as ventricular a position as possible after ensuring I will have 1 to 2 mm of the THV on the atrial side of the bioprosthesis. My rational for aiming for the most ventricular position is to allow better expansion of the THV leaflets. This is similar to what we do in transcatheter aortic valve replacement, in which we aim for the most aortic position possible to allow better gradients. However, in cases like the one presented here, in which the bioprosthesis is taller than the THV and we know that the leaflets of the bioprosthesis end at the ventricular edge of the radiopaque markers, I would aim to have the ventricular edge of the THV stent frame at the atrial side of the markers located in the ventricular edge of the bioprosthesis. This allows us to completely cover the leaflets of the bioprosthesis and to have 1 to 2 mm of THV on the atrial side of the sewing ring for anchoring. I would consider the following during deployment: (1) because the marker of the THV delivery system will move during deployment, so too will the atrial edge of the THV as it will foreshorten; (2) the ventricular edge of the THV does not move during deployment as foreshortening occurs from the other side; and (3) we have a landing zone for the ventricular edge of the THV. Therefore, I would not pay attention to the marker or the atrial edge of the THV during deployment. Instead, I would place the ventricular edge of the THV at the ventricular edge of the bioprosthetic markers and focus my attention in keeping that position during a slow deployment under fluoroscopic guidance. Dr. Barbanti: The alignment of the valve is carried out mostly on fluoroscopy using the radiopaque marker of the surgical valve. CT can be helpful to assess the left atrium and left ventricle dimensions to assess whether there is enough room to steer the delivery system perpendicularly to the surgical mitral valve. Given that this patient had a bioprosthetic valve that was difficult to visualize by CT, the manufacturer supplied true internal diameter dimensions of the surgical prosthesis, along with a three-dimensional computer-aided design sizing and valve simulation, suggesting a 29-mm Sapien 3 valve for valve-in-valve implantation. The patient’s baseline left ventriculogram demonstrated severe mitral regurgitation (Video 3). Transseptal delivery and alignment of the 29-mm Sapien 3 valve was made to the ventricular markers of the degenerative bioprosthesis using predetermined CT fluoroscopic C-arm angles (Video 4). Final post-TMVR left ventriculography confirmed positioning of the 29-mm Sapien 3 valve with no residual mitral regurgitation (Video 5). Disclosures: Consultant to Edwards Lifesciences, Boston Scientific Corporation, and Materialise; receives grant support assigned to her institution for serving as the CT core lab for the MITRAL study and for serving as the CT and echo core lab for the NIH LAMPOON clinical trial; patent assigned to her employer Henry Ford Health System on LVOT prediction modeling planning software. Disclosure: Served as a proctor and has received research grant support from Edwards Lifesciences. Disclosures: Consultant to Edwards Lifesciences; advisory board member for Biotronik.